SEAL-TIGHT Original Cast and Bandage Protector for daily showering, therapeutic care or bathing only (see our DryPro listings for protectors suitable for swimming and aquatic exercise). Durable polyvinyl bag prevents water penetration and lasts 6-8 weeks with daily usage and normal care. Excellent for a situation which requires the protection of a cast or bandage. SEAL-TIGHT also protects skin against water penetration e.g. ulcers. Nonlatex diaphragm stretches over cast or bandage to form watertight seal. Size: Adult Short Leg 24" Sizing of Adult Short Leg: Measure from tip of heel to top of cast and add 1 inch. 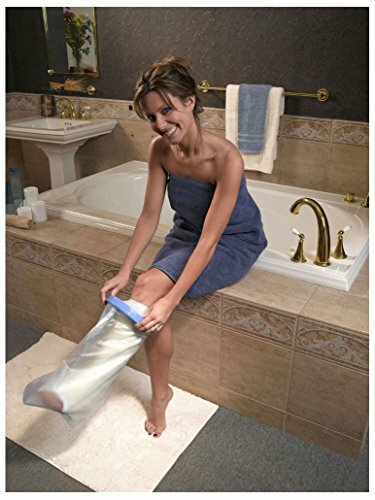 Hole Size: 1 13/16" Circumference Range: 8" - 18"
SEAL-TIGHT Original Cast and Bandage Protector for daily showering, therapeutic care or bathing only (see our DryPro listings for protectors suitable for swimming and aquatic exercise). Durable polyvinyl bag prevents water penetration and lasts 6-8 weeks with daily usage and normal care. Excellent for a situation which requires the protection of a cast or bandage. SEAL-TIGHT also protects skin against water penetration e.g. ulcers. Nonlatex diaphragm stretches over cast or bandage to form watertight seal. Size: Adult Short Leg 24" • Hole Size: 1 13/16"
Circumference Range: 8" - 18"
Sizing of Adult Short Leg: Measure from tip of heel to top of cast and add 1 inch.